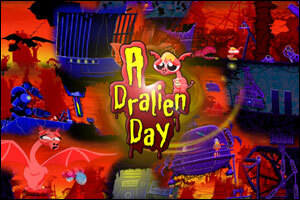 Dralien Day, the latest Point’n’Click adventure game designed by Robin Vencel, is live! “This game is about a little Alien Dragon named ‘Dralien’ who has to find his mom after she gets taken by dragon hunters. It’s got some little action bits in it also but if you wish you can skip those if you fail them. 1. Click on the H-S on Egg. Once it moves, click on the same H-S, and the Egg will fall down and crack! 2. You see the 2 Triangle-Shaped reflectors with H-S on the middle of them. Click on the highest one’s H-S [Near Left-Side of Screen] – 3 Times! Once done, click on the lowest Triangle-Shaped reflector [Middle of Screen, above Dragon] – 1 Time! 3. Click H-S on the Cannon Balls, right to the Dragon. Then, click on the Wheel [Right to the Dragon] – 2 Times! Once done, click on the Cannon Machines Lever [Top-Right], and it will shoot a Cannon Ball. If you rotated the reflectors correctly, the Cannon Ball will reflect and hit the Monster inside Cave [Bottom-Left]. Click H-S on Dragon to continue quest! 4. There are 2 Sticks below the Dragon. One small, and the other one long. Click on the Small one to rotate it, and then the long one to rotate it too! Click on the Plant above the small stick, and it will spit out some strange liquid. Fortunately, the bug will come to eat the strange liquid, and once he’s there, Quickly click on Dragon to jump on the bug! He will fly back to his previous position, and you’ll get off him. Once done, click and hold on the H-S at bottom of the Big Gear. Once Dragon is at the top, click him to continue! 6. Click on the H-S with an Arrow inside pointing UP, to enter the Ship! Click on the Electric Box [Right-Side inside Ship], and click on all of the Circles – 3 Times, so that they form a straight line. 7. Once done, something will be opened behind the Dragon with some black Rectangles. If you look outside the Ship on the Right-Side, you’ll see a 5×5 Board. Those Black Rectangles shows which buttons you have to press on that board. Once done, the Ship will be unlocked. Click on the Lever on the Left-Side of where the Dragon is (but don’t enter Ship). The Ship will begin to fly away, but you’ll see that it’s attached with a chain. Once the Ship returns on the ground, look at the end of the Chain, and you’ll see a H-S on it’s end. Click the H-S, to unattach, and click on the Level once more! 8. Prepare for Mini-Game. Hold down your Mouse Button and shoot all the flying robots, and avoid being attacked. And remember that you have to point the Cursor on the Robots in order to shoot them! It is Highly Recommended to change the Quality to “Low” if you’re computer is slow or lags. If you don’t change quality with a slow/laggy computer/laptop, you will have to wait twice as the main time to arrive to the destination you’re flying to! 9. Once Mini-Game is done, you’ll crash and land inside a cave! You see the Black Plug-In, next to the Big Machine. Click it’s H-S – 5 Times! Left to the Plug-In, there is a lever. Click the Lever – 5 Times! If correctly done, the Machine will start. The Dragon will move onto the end! 11. Click on the small H-S Ring on the wall (not the door). Note the Pattern near the “Follow the Doors” – and zoom out! Enter door, and remember to this quickly or else you’ll die of the poisonous gas! If you did it correctly, you’ll come to another Air Craft, so enter it! 12. Prepare for another Mini-Game where you have to avoid all the things around you [Including the Walls] – Steer the Helicopter by clicking the Mouse to raise it, and let go of the Mouse Button to fall down! 13. Once done, you’ll come to the Final Boss Arena! Note the Colors on the Wall blocking your Way from Top to Bottom [Red, Purple, Yellow, Green]. Click on the Panel next to the Wall! Once done, hit the Enter Button – if correct, the wall will open! 15. Prepare for Final Boss Battle – click on the Machine Gun right in front of you, to use it! You see the Sharp Spike-Shaped Rock on Top of the screen, above the Robot. Hold down Mouse Button and shoot that Rock, to defeat the Boss! Their is an in game walkthrough so I don’t need to write one. Nice and easy for the most part. Only scored 69500 on first try but I did skip the one level for a 20,000 pt penalty. Cute game like Bowja. Posted on Thursday, October 22nd, 2009. Follow any responses through the RSS 2.0 feed.